I started off the morning with volunteering with the OSU Recycling Center's on-campus move-out efforts from 8am to 10am. So although I was volunteering (which is supposed to be a good thing) and having a hand in the move-out efforts put on by the campus (a personal passion of mine), it did put me in a bit of a sad mood. Then I had to come home and work on this grueling manga which had been taking up a lot of my time when what I really wanted to be doing was getting items from the Greek Chapters I'd been in touch with. I was starting to wonder "is anything going to come of all the energy I've poured into the donation drive move-out with them?" A few of the houses have been impossible to get a hold of, and the others keep insisting nothing's really been gathered yet, and to wait for Friday/Saturday. On one hand, I dread that it'll be a piddly little turn-out, and I'll have hardly made any difference. So yeah, I was a bit of a mess. In the middle of the afternoon, I got the okay from the Chi Omega sorority to come and pick up some items that had been accruing in their little donation pile. I drove the car up and this is what I was able to pick up! 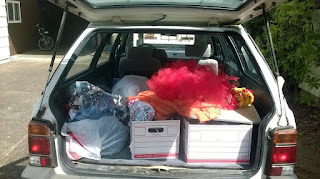 The moment I got home, I sorted the item and started posting them on the Corvallis Families Gift Economy page. It feels so great to know that these are items that are willingly being parted with by people who honestly didn't want them anymore, and they are finding homes with people who are enthusiastic about receiving them. Oh, well. I will go out again tomorrow night, me thinks~! OH! And the icing on the cake, was getting word back from CWS that they'd accepted our tuition adjustment plea so that both kids can go to school there again next year :D Yaaaaaay!!!!! So yeah, what a day of despair and hope, frustration and progress. Thanks for stopping by, and until next time, take care and Happy Roller Coaster Day! !